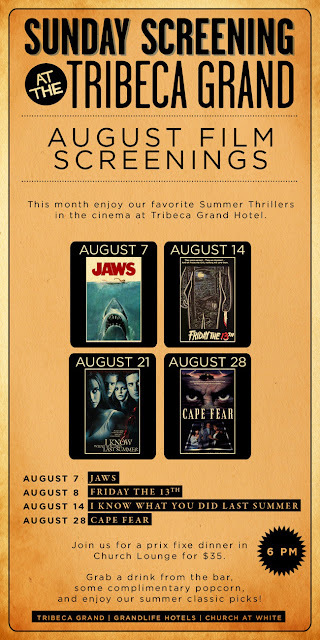 This month, the Tribeca Grand Hotel in downtown Manhattan is screening summer thrillers every Sunday @ 6pm for FREE. Upcoming flicks include Friday the 13th, I Know What You Did Last Summer, and Cape Fear. Free popcorn... Hang around after the movie b/c @ 9pm they show the HBO hit show True Blood for FREE as well.